Tunic tops have become my go-to for the weekends, sporadically on casual Fridays at work and especially on vacation. I've come to really like the overall simple style, which I feel exudes comfort, flirty fun and versatile with jeans, legging or worn solo with stockings.. daring but oh so doable. 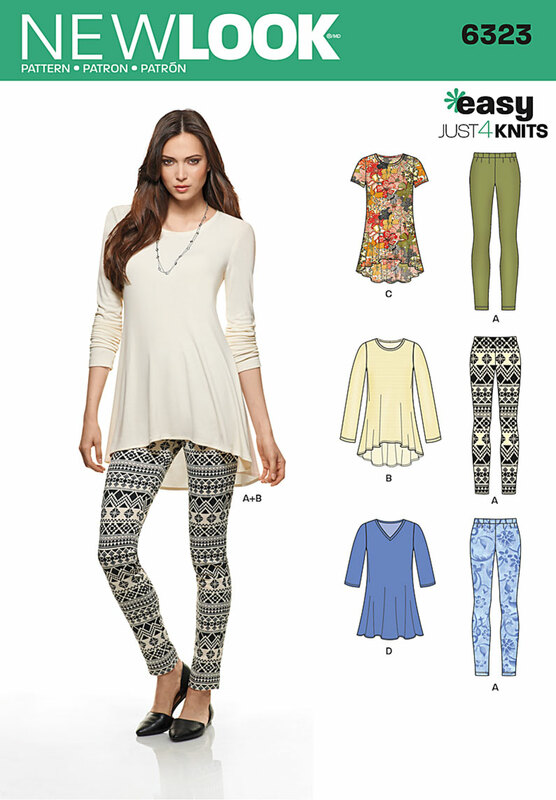 In come, New Look 6323: Misses tunic with a crew neck with short or long sleeves, or v-neck with 3/4 sleeves. Also included in the envelope is pull on leggings with elastic waist. 3 easy patterns pieces and with that, made version D, but tweaked the neckline for a scoop neck and sleeves from Version B.
I made two tunics in 2014 for my November vacation and let me tell you they were perfect for Atlanta temps. The first one I used a beige/creme printed double knit for the body and sweater knit for the sleeves. Cut a medium, but once it was constructed it was too big at the neckline and torso. With that I removed 1/4" from each side seam and added darts at the back neckline. 1/2" wasn't enough and serged off another 1/4" from each side seam, thereby making it a better fit. The length was perfect for my 5'3" height. The neckline, sleeves and hemline were pressed to the inside and final stitched. For the second tunic, I used a tweedy knit and pleather for the sleeves and tweaked the pattern pieces. I cut a small for the neckline, shoulders & body, but kept the medium for the armholes and because I was short on fabric shortened it. 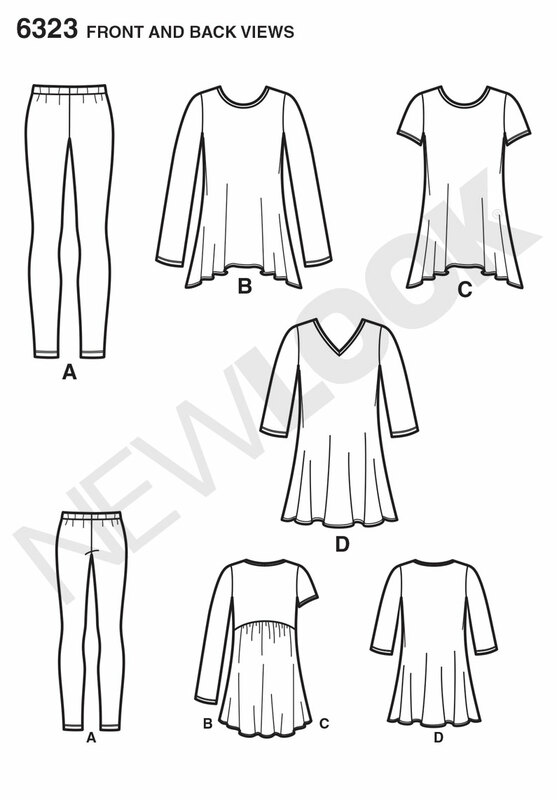 Like the first one, all the seams were serged and used the same process for finishing the neckline, sleeves and hemline. The finished measurements for the bust for a small is 35" and I am a 40" and found the pattern ran big in that area. So thinking that they failed to mention ease above finished measurements. Despite all that, they work well for weekend wear and with easy & effortless Fridays have rocked the tweedy one on Casual Friday. Seriously, the question begs, is it a top or a mini dress, whatever the case, I have gone so far as to be daring and worn it as a dress with spandex shorts and stockings... it totally felt flirty, fun and honestly @ 50+ life is all about what one wants not what others thinks. Hey Shelia; why is it that whenever there's two of something I always feel that I have to choose which one I like best? I'm hard pressed in making a decision here - so I'll just say "LOVE THEM BOTH". Like your comment about what's more important is what you like rather than the opinion of others. I love both of these! What a great interpretation of the pattern. May I ask a question? Do you have challenges wearing the pleather against your skin? I don't mind wearing it with lining underneath it but right up against my skin it bugs me. This is a great pattern. I hope you make more! Thank you Carolyn. The pleather is a dream to wear, it has a satin like knit backing. Sheila, really cute tunics. I like both of them! Great idea. Tunics look great on you. Effortless and chic! I like both tunics and the fabric used for both. As always a great job! Beautiful tunic dresses Sheila. I love the pleather sleeves on version 2. Really, really love both of these. They compliment you so well! Well done - they look great on you! A great wardrobe staple that is also fun! Love this top on you, Both are super cute, but I really like the one with the faux leather sleeve too cute. Looking good Ms. Sheila! I'm glad you reviewed this pattern...I have it and have not used it yet. I like both your versions and especially the one with the contrasting sleeve! Beautiful work!